A place of crafty inspiration and comfort as I attempt to make the world a better, happier place. I had to send two RAKs (Random Acts of Kindness craft happy mail) to Canada this month, so of course I had to make a card to send too. This is the second one. I used Stampin’ Up Tangerine Tango cardstock for my card base and retired SU DSP for the two layers on top. Hubby helped me figure out the mathematics for dividing the top paper into thirds since I had an odd size. The sentiment was cut out of a craft magazine from the UK. I’m a Stampin’ Up Demonstrator! 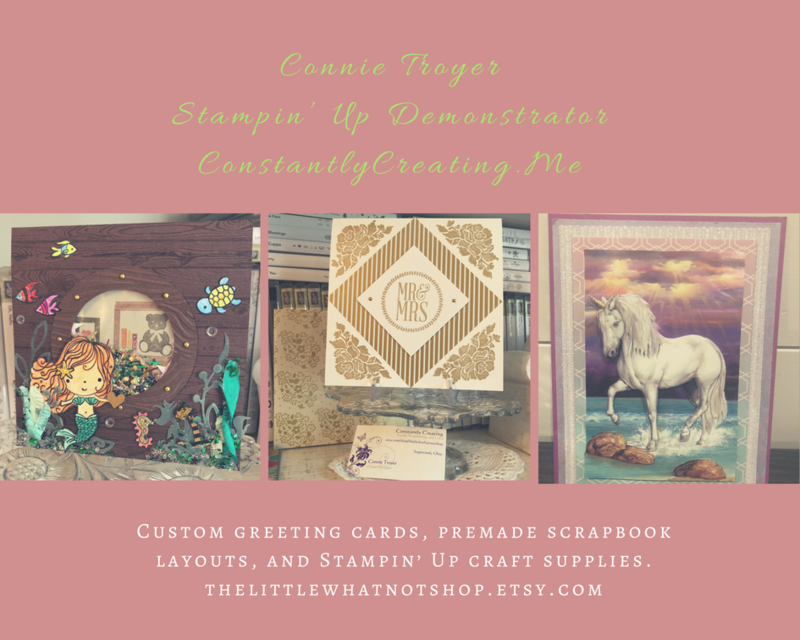 I’m a newish Stampin’ Up Demonstrator and would love to help you purchase or use crafty items, so please let me know if I can be of assistance! Click here to shop with me now! The content in this blog is the sole responsibility of Connie Troyer as an independent Stampin’ Up! demonstrator and the use of and content of classes, services or products offered is not endorsed by Stampin’ Up! I have my own little Etsy shop at http://thelittlewhatnotshop.etsy.com where I post cards and scrapbook layouts for sale as well as craft supplies, antiques, collectibles, and whatever else catches my fancy. Amy Koenders, Independent Stampin' Up! Demonstrator in Alpharetta, Georgia (Atlanta)...Let's make some cards!